MINNEAPOLIS--(BUSINESS WIRE)--Dec. 28, 2015-- J.D. 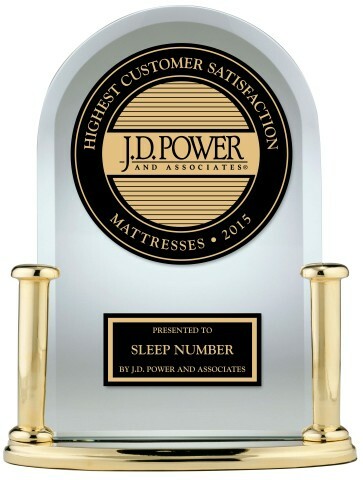 Power today announced that Sleep Number ranks highest in customer satisfaction with mattresses. The J.D. Power 2015 Mattress Satisfaction Report measured customer satisfaction with mattress purchases based on seven factors: comfort, price, support, durability, warranty, features and customer service. Sleep Number achieved an overall satisfaction index score of 878, which is 43 points above the industry average of 835. In addition, Sleep Number achieved the highest score in the price, warranty and features study factors. The J.D. Power 2015 Mattress Satisfaction Report is based on responses from 2,660 customers who purchased a mattress in the 12 months prior to fielding the survey. The report was fielded from November through December 2015.